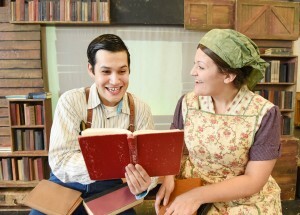 Childsplay production of Tomas and the Library Lady takes place at the Smith Opera House Dec. 10. At the University of California at Riverside, the Tomás Rivera Library is named after the man who became the UC system’s first minority chancellor. The upcoming play at the Smith Opera House, “Tomas and the Library Lady,” dials back to a poignant time in the late chancellor’s boyhood when he realized that words and language and stories could change his life. In addition to being a widely respected university administrator, Rivera was also an author, poet, educator and education activist whose humble beginnings as the son of Mexican migrant farm workers make his life story all the more inspiring. Pat Mora’s beloved 1997 children’s book, Tomás and the Library Lady, reimagines a spring and summer in Rivera’s boyhood when his family left their home base of Texas to travel to Iowa for work. Award-winning playwright José Cruz González’s stage adaptation by the same title will be performed at the Smith Opera House on Monday, Dec. 10 at 10 a.m. as part of The Smith’s ArtSmart Educational Theatre series. The play is presented by Childsplay, a Tempe, Ariz.-based theater company where González is playwright-in-residence. It is designed for audiences age 5 and older. Those hot months of 1944 were made magical for Tomás by his discovery of the town’s public library and its books, and the friendship he developed with one special librarian who was as eager to learn Spanish words from Tomás as he was to read about the outside world. The play is intermingled with Spanish, but is understandable by native speakers of both Spanish and English. Even as the next generation of kids are more likely to read their first words on an iPad than in a library, the lessons learned by Rivera’s story are timeless, González reflects. All ArtSmart performances at The Smith are sponsored by Lyons National Bank and the Nelson B. Delavan Foundation. General admission tickets are $6.50 and are available at the door, at the Smith Box Office as well as online.